Since I don’t like to combine letters in this series, today’s post covering the letter X is, well, tiny. Sorry, no X-Japan, Xavion, Xavier, Xyster, or Xymox here, but we do have XTC, so enjoy one track from the bottom three-fifths of the Billboard Hot 100 chart during the 1980s. 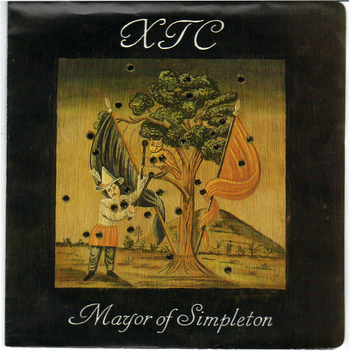 XTC was never about singles, though — they’re one of those bands where success certainly can’t be measured by chart performance. Even in their native England they didn’t have a whole lot of chart success, and in the U.S. they were only able to crack the Hot 100 once, in 1989. “I’ll always equate ‘Mayor of Simpleton’ with the long tardy arrival of cable television to my backwoods neighborhood in May of 1989. To this music-head, the natural focus was MTV, which I’d only been able to glimpse beforehand via friends, relatives, and motels. My Sunday nights were spent with a fresh tape in the VCR to catch the latest modern-rock offerings from 120 Minutes, where the ‘Mayor’ video was screened with almost weekly regularity. The single soon joined ‘Dear God’ in my seven-inch collection, followed shortly thereafter by the full Oranges & Lemons CD. That album (spaced over two discs in its vinyl configuration) gets soggy towards the middle, but the first half (and the closing ‘Chalkhills and Children’) make it a worthy possession. “One of the many bands often described as ‘they would’ve been huge if only…,’ but in XTC’s case it’s more true than most: a case of stage fright for co-bandleader Andy Partridge in 1982, just as they were on the brink of stardom, prevented them from touring ever again. But it likely enabled them to spend more time in the studio perfecting two of their greatest albums.